The Richard and Nancy Guerrant Center for Global Health Scholar Award | Center for Global Health, U.Va. Dr. Richard L. Guerrant is the Founding Director of the Center for Global Health. He and his wife, Nancy, have contributed years of service to support education, development and international opportunities for Global Health practitioners. Dr. Guerrant's pioneering work in Infectious Disease has produced over 500 peer-reviewed publications. He has sustained collaborative training programs with multiple partners, most notably the Federal University of Ceara in Brazil, which has supported collaborative mentoring for a highly productive cohort of global health leaders. The Richard and Nancy Guerrant Center for Global Health Scholar Award supported four scholar projects 2018. Megan Eisenfelder, Sarah Cox, and John Leahy, all in the College of Arts & Sciences, and doctoral student, Claire Kirchoff in the Curry School, are the team responsible for the UVA-SWO Partnership for Rangeland Ecology Research and Education conducted in the Lake Traverse Reservation in South Dakota. The team evaluates if bison grazing better for the tall grass prairie on Native American Reservations in economic, environmental, cultural and health terms? Knowledge from this project is projected to lead to increases in turnover from cattle to bison ranching. In addition to collecting the ecology data, the team will be running an education program advised by the Curry team member. CLAS student, John Hensien, advised by Professor of Infectious Diseases, Dr. Eric Houpt, worked at the Haydom Lutheran Hospital in Tanzania, participating in the research project, “Relationship Between Early Malnutrition and Metabolic Syndrome in Tanzania” which considers how early malnutrition and stunting contribute to a later risk of metabolic syndrome amongst the MAL-ED cohort in Tanzania? This project builds on previous MAL-ED research and includes obtaining and analyzing blood pressure, height, weight, and waist circumference data in the field. Andria Li, Parker Brodsky, both in the College of Arts & Sciences, and 1st year Medical student, Anna Buttaci, collaborated on “Improving Health Outcomes and Fostering Community Development through Potable Water” in the Community of San Lucas Tolíman, Guatemala. The team worked with several communities in San Lucas Tolíman to evaluate the effectiveness of the implemented water filtration systems from previous years. In addition the project assesses the perceptions of community members towards the water filters, while contributing to the educational component of the water filtration systems. Religious Studies Doctoral candidate, Michelle Walsh, proposed Culture, Psychology and Buddhist Practices: An Ethnographic Study in Contemporary Bhutan with the Bhutan Ministry of Health. The project was developed to evaluate the relationships between culture, mental health and Buddhist practices in Bhutan. The motivation driving this research is twofold: firstly, while Buddhist meditation practices have been used as interventions to address mental health issues worldwide, the impact of contextual factors in the experience of meditation practice has not been adequately studied; and secondly, Bhutanese officials report there is an increase in the rate of suicide. The Richard and Nancy Guerrant Center for Global Health Scholar Award supported four diverse scholar projects in 2017. “Secondary Language Acquisition in Adult Refugees: Barriers and Facilitators” was conducted by Emily Cloyd, CLAS, who worked in close collaboration with Dr. Fern Hauck, Director of the International Family Medicine Clinic (IFMC) at UVA to better understand successful second language acquisition and the quality of “integrativeness” that helps or hinders local refugees as they learn English and assimilate with the local community. This critical study was shared with IFMC clinicians, colleagues at the local International Rescue Committee (IRC) and study participants in the hope of directly informing their respective efforts. Luke Harris, Masters in Landscape Architecture, conducted the ﬁrst phase of, “Mosquito Urbanism: The relationship between mosquito control practices and the built environment”, a planned comparative global study of attempts to control populations of the Aedes aegypti mosquito, carrier of the Zika virus, along with Dengue and Chikungunya. He examines mosquito control, traditionally a part of the discipline of public health, as a collection of spatial and ecological practices that inﬂuence human behavior and the form of cities, considering how spatial arrangements, topography, and water drainage in urban areas contribute to the creation of mosquito habitats in multiple areas in Nicaragua. Joshua Sagartz, Frank Batten School of Leadership and Public Policy, worked under the mentorship of Professor Jeanine Braithewaite, Professor of Public Policy at Batten, to implement, “Social Welfare and Traditional Healing in Limpopo, South Africa.” This study examined the interrelationships between social welfare, including social grants and traditional healers and the traditionally religious by employing student teams at the Batten School and the University of Venda to analyze development, poverty, and health factors through multiple different lenses, incorporating both theoretical understandings and the practical application of data analysis. Fota Sall, CLAS, building on the work of prior CGH Scholars, examined breastfeeding practices among HIV positive mothers at the University central Hospital of Kigali (CHUK). This study informed a curriculum supporting new mothers who are HIV positive in practices including taking daily medication to reduce the mother’s viral load, limiting breastfeeding to the ﬁrst 6 months and diminishing the risk of transmission of HIV to the infant. 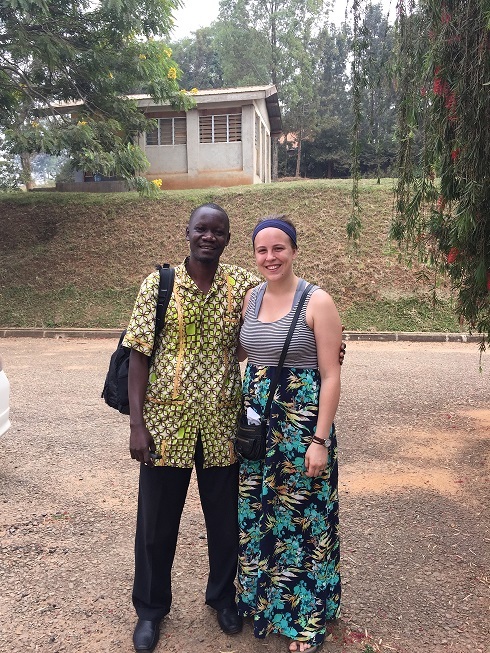 In 2015, NRLG awardee, Anna Long, working under the collaboraative mentorship of UVA-Mbarara site director, Christopher Moore, MD, researchers at Mbarara University of Science and Technology (MUST) and the Médicins sans Frontières supperted Epicentre Mbarara Research Base (Epicentre), focused on drug resistance in the malaria endemic region of Southwestern Uganda. A better understanding of the presence of drug resistance will inform local/regional malaria epidemiology and in turn improve public health policies and clinical practices. The 2014 Nancy and Richard L. Guerrant Center for Global Health Scholar Award designee was Mary Namugosa, CLAS, whose work focused on a community study of the prevalence of non-plasmodium falciparum malaria in Southwestern Uganda using PCR analysis of blood slides. The inaugural Nancy and Richard L. Guerrant Center for Global Health Scholar Award designee was John Burns, College of Arts and Sciences: Echols Scholar Interdisciplinary Major - Global Health Economics Major and Mathematics minor, who conducted a comparative analysis of Micro-Health Insurance in Rural Tanzania.